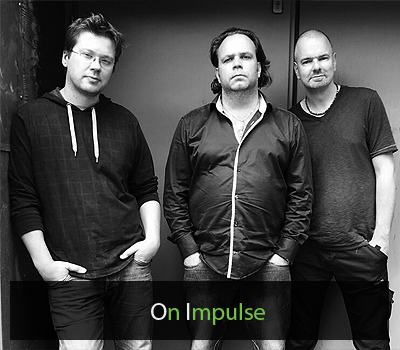 The music of “On Impulse” is best described as electric Jazz/Fusion in the classic sense. Only the look of their instruments will already give you a feeling of nostalgia: Coen is sitting between his organ and fender rhodes. Also the analog synth sounds will bring you back to the days of early jazzrock, not the cold digitalized sound of the postmodern. Frans is playing his old and worn Fender Jazzbass wich will remind you of the days of Jaco Pastorius, and with his “high energy” grooves, drummer Sebastiaan is the motor of the group. The band already paid their dues on the road before releasing their first album performing with Randy Brecker on trumpet and Nigel Hitchcock on saxes (the last one can be heard as a guest on their debut album). Because of the deep chemistry between the bandmembers and the ability of the band to create explosive yet meaningful music on the spot (hence the name “On Impulse”) their first studio album is recorded entirely live. No repears were done afterwards and only a few arrangement overdubs were permitted. The result is a jazz-fusion album in the most pure form, truly seizing the energy and ideas this band is capable of producing on the spot. As high as the level of musicianship is on this release, the standard regarding soundquality was set equally high to ensure a superior sound and maximum dynamic range. Something not heard very often in modern recordings. Their first release does justice to the band “On Impulse”. High-energy jazzrock from today’s artform flamekeepers with clear nostalgic echo’s of the past.